Buying US Dollar in India Made Easy! How To Exchange US Dollar in India? Being a Forex marketplace, every money changer competes with others. They will always offer you the best USD buying rate, so that they get your order. You may not get the same rate if you directly walk in to the same store. We charge absolutely zero commission on every transaction. No hidden charges either! Pay directly to the chosen money changer and receive your US Dollar currency along with the invoice. US Dollar rates can vary too much depending on the demand & availability. With Extravelmoney, you can observe and lock the rate when it is favorable. Just pay a small fully refundable rate lock fee & lock the rate for as much as 3 days! 1. How to exchange Indian rupee to US dollar in USA? The Indian rupee is a restricted currency, i.e., the RBI very strictly monitors the outflow of the rupee and restricts the maximum amount of rupee a person can carry when going abroad (Rs 25,000). As a result, you would not be able to find a trustable bank or money exchange agent in USA who can exchange your Indian rupee to US dollars. Of course, there might be someone willing to take in your Indian rupee and give you US dollars in exchange in USA but the exchange rates are going to be atrocious and finding such a person or business institution a big hassle! Instead, we recommend you to purchase US dollars before going on your trip. Exchange Indian rupee to US dollar in India easily, from your bank or from an RBI authorized money changer. 2. How to convert dollars to rupees in India? Returning back from a trip abroad and have US dollars in hand? You can easily convert US dollars to Indian rupee in India through ExTravelMoney.com. ExTravelMoney is an online aggregator of forex services offered by banks and money changers in India. Compare the exchange rates offered by different forex vendors for selling US dollars in your town or city. After comparing, choose the forex vendor giving the best exchange rate and place your order online. This way, you can convert US dollars to rupees, maximising your profit! 3. How much cash can I carry to USA from India? A resident Indian is allowed to carry to USA from India a maximum of USD 3,000 (approximately Rs 1,97,000 as per today’s US dollar rate in India) as cash and a total of USD 10,000 (approximately Rs 6,56,000) in the form of forex card and cash. As far as Indian rupee is concerned, a resident Indian can carry a maximum of Rs 25,000 on trips abroad. 4. How to exchange rupees to dollars in India? It’s really easy to exchange rupees to dollars in India. It can be done in almost any town or city in India. Approach your bank where you have an account and buy US dollars from them by exchanging it for rupee. Otherwise you can go to a money changer store near you and do the same with them. There are many money changer stores that offer their own exchange rate for US dollar. You can use extravelmoney.com’s online forex platform to compare the exchange rates offered by different forex stores and make an informed choice. 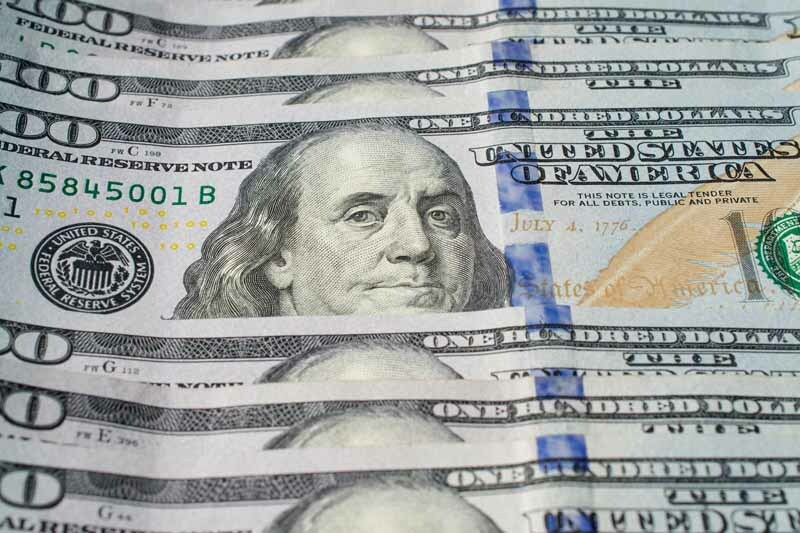 Buy US dollars online from the money changer offering the best rate! Lock the exchange rate, place the order online and get US dollars delivered to your home. Buying forex online has never been this easy before! 5. Which is the best forex card for Indian students in US? The best forex card for Indian students in the US would depend upon the advantages of the forex card. A forex card with no activation charges, ATM withdrawal fees abroad, inactivity fees and zero encashment fees can be considered as good. Also, an important thing for students going abroad to keep in mind is the exchange rate at which the bank or money changer is ready to load US dollars in their forex card. The forex store offering the best USD-INR rate should be considered. The best rate is the one in which lesser amount of INR can buy 1 US dollar. 6. What is the best way to take spending money to USA? The best way to take spending money to USA would be use a combo of methods to carry money. Arrive at a rough figure of the total money required for your US trip and make sure to add a net for emergency expenses. Carry about 40% of this total in US dollar currency notes as cash. Load the rest 60% in prepaid forex travel card. Don’t forget to carry your international credit/debit card as backup money. This strategy is best explained in the post : The best way to carry money abroad. 7. Which is the best forex card for USA from India? To find the best forex card for USA from India, simply choose from the many multi-currency forex cards available in ExTravelMoney. Take a look at the exchange rates of forex cards offered by different forex vendors and banks in your location. By comparing, you can find the forex card offering the best exchange rates in your city. You can even book the forex card online and get it door delivered to your home or office! Get the best value prepaid forex travel card for your money. 8. What are the documents required for buying US dollar in India? 2. A confirmed air ticket showing travel within 60 days from the date of buying US dollars. 9. How many days in advance can a person buy US dollars for travel abroad? Reserve Bank of India allows a resident Indian to buy US dollars, at the maximum, 60 days before their date of travel abroad. If due to any circumstance that arose later, the person has not been able to use this foreign exchange within 60 days, then it must be surrender to their bank or to an RBI authorized money changer. 10. What are the various US dollar denominations available for use? The US dollar is the official currency of the United States of America and is also the most widely held global reserve currency. Several countries use it as their official currency and de facto currency. The US dollar currency notes can be found in denominations of $1, $2, $5, $10, $20, $50 and $100. The denominations of coins used are 1¢ (Penny), 5¢ (Nickel), 10¢ (Dime) , 25¢ (Quarter), 50¢ (Half dollar), and $1 (Dollar).